AimSHOT Green Laser Master Rifle Bore Sight kit! This kit includes the external battery pack green laser bore sight along with all 16 of their rifle caliber arbors. 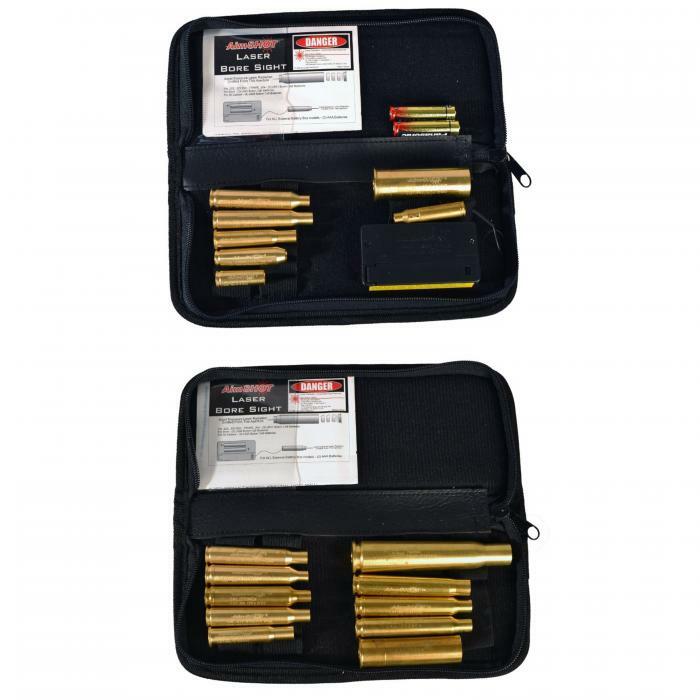 You will be able to bore sight just about every major calibers with this kit. AimSHOT offers the only chamber based green laser bore sight on the market. Includes BSB223G laser bore sight (two AAA batteries give is 20+ hours of run time), AR243, AR264, AR3006, AR3030, AR762, AR20GA, AR22-250, AR270WEA, AR270WSM, AR300WEA, AR300RSUM, AR375HH, AR7MWSM, AR8MM, AR50, and AR12GA all in two nice zippered nylon pouch. All arbors and bore sight are machined from solid brass for years of useful life and no chance or marring or scratching your chamber. Please refer to AimSHOT website for specific caliber fitments. AimSHOT patented the original chamber based bore sight system and continues to improve on the design. Our system is the best on the market utilizing a single laser bore sight (223 for the rifle calibers), and then a hollow "arbor" for different calibers that accepts the laser bore sight. If you need to bore sight additional calibers, you only need to purchase a new arbor, not another laser!